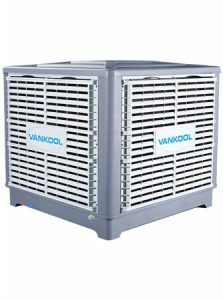 Many people get confused when choosing a conventional air conditioning and an evaporative cooling air cooler.Both of them could be used to cool the air,and each product has its own benefits and disadvantages.The one which could be the best choice will be depends on many factors like the climates where you live,the cost you wanna pay,the temperature and the air quality you want to get,etc. 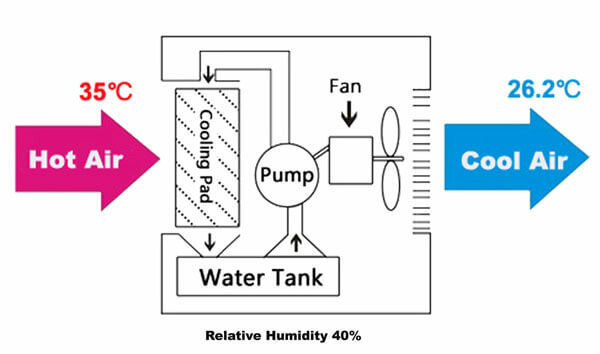 What is air conditioning and evaporative cooling? Air conditioning(often referred to as AC,A.C.,or A/C) is a process of removing heat from a confined room by using chemicals.The chemicals used are called as refrigerant gas,which could be easily converted from a gas to a liquid and back again.And the heat will be transferred from the air inside home to the outside air by using such refrigerant gas. Evaporative cooling (also called as evaporative air cooler,desert cooler or swamp cooler) is one of the oldest forms of climate control still found today.Remember when you come out of a swimming pool and how a breeze feels on your skin,that is the simple idea of evaporative cooling. 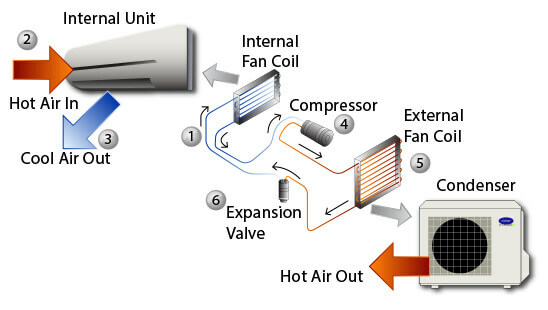 How does air conditioner and evaporative cooler works? 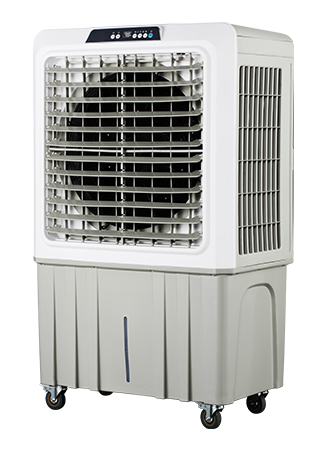 The air conditioner has 3 main parts,which are compressor,condenser and evaporator.The compressor and condenser are usually located on the outdoor unit of the air conditioner,while the evaporator is located on the indoor unit. The refrigerant gas arrives at the compressor as a cool,low-pressure gas.The compressor squeezes the gas,which packs the molecule of the gas closer together.The closer the molecules are together,the higher its energy and its temperature. The working refrigerant leaves the compressor as a hot,high pressure gas and flows into the condenser.When you look around the outdoor unit of the air conditioner,you can find that condenser which has metal fins all around.That fins acts like a radiator in car and helps the heat go away quickly. When the working gas leaves the condenser,its temperature is much cooler and it has changed from a gas to a liquid under high pressure.After that the liquid flow into the evaporator through a very tiny hole.On the other side,the liquid’s pressure decrease and it begins to evaporate into gas. As the liquid changes to gas and evaporates,it absorbs heat from the air around it.By the time the working gas leaves the evaporator, it is a cool, low pressure gas. It then returns to the compressor to begin its trip all over again. The principle of evaporative cooling is very simple.Evaporative cooling occurs frequently and natually all around us.For example,when you come out from a swimming pool,you will feel cool.Such cooling effects occurs because as dry air passes through water,the dry air will absorb some water.water molecules turn into gas molecules and heat switches from the higher air temperature to the lower water temperature. Since the air circulates naturally, the area around it is cooled. 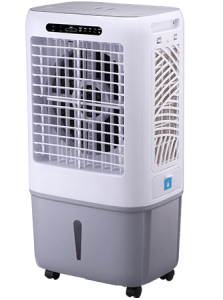 The modern evaporative cooler uses a fan to draw outside air through wet filter pads. This filters the air of impurities and lowers the air temperature due to the evaporation of water within the pads. The cooled air is then distributed or directed into the building. The filter pads are wet by a pump which pumps water up to the top of the pads, from where it trickles down. 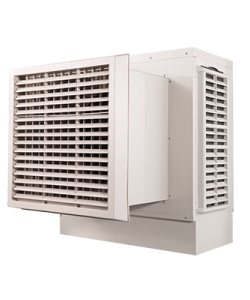 The moisture content of the supplied air is increased, however this does not matter provided the air is cooled sufficiently. You can find below comparison sheet and see the difference between the evaporative cooler and conventional air conditioner. How to choose? 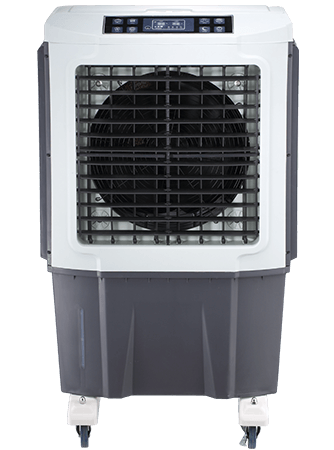 Evaporative Air Cooler or Air Conditioner? Generally you’d better take below factors into consideration before you make the decision. 1.The climate where you live is. 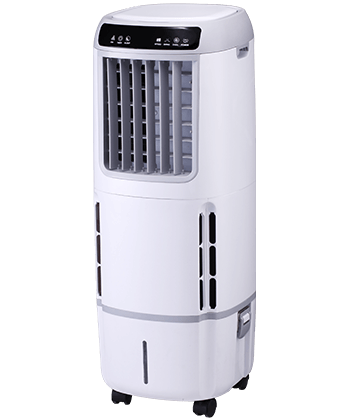 If you live in a hot and dry area,there’s no doubt that evaporative air cooler will be the best choice for you since you can get so many benefits from the air cooler like natural air,moisture,low energy cost,low installation cost,etc. 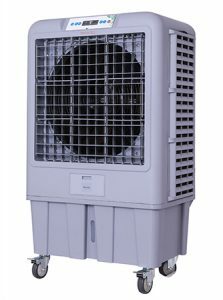 While if you live in a quite wet place and you want to buy a cooler for your family use,then air conditioner will be a better choice for you since the evaporative air cooler will add moisture to your room.But if you want to choose a cooler for outdoor use,then evaporative air cooler will be a better choice again since air conditioners are always used in a closed environment and it does not work well in a open environment.